Biography | Quatuor Mosaïques | Kirshbaum Associates Inc.
Quatuor Mosaïques is the most prominent period-instrument quartet performing today. The ensemble has garnered praise for its atypical decision to use gut-stringed instruments which, in combination with its celebrated musicianship, has cultivated their unique sound. The quartet has toured extensively, won numerous prizes and established a substantial discography. Formed in 1987, the group is comprised of Austrians Erich Höbarth (violin), Andrea Bischof (violin) and Anita Mitterer (viola), and French cellist Christophe Coin. 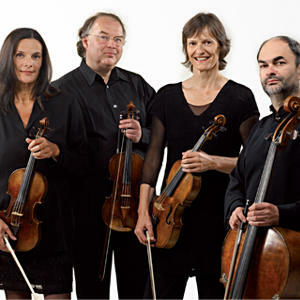 These four musicians met while performing with Nikolaus Harnoncourt's Concentus Musicus Wien in the 1980s and decided to perform on original instruments as a classical "caper quartet." Although the quartet performs on period instruments it embraces the European quartet tradition, constantly allowing for the evolution of its repertoire as it strives to reveal the music's psychological underpinnings. For the first time in three years and in celebration of their 30th anniversary season, Quatuor Mosaïques recently embarked on a North American tour in October 2017, performing at the Princeton University Concerts series, the Celebrity Series of Boston, Duke Performances in Durham, North Carolina, Da Camera- Chamber Music and Jazz in Houston, Friends of Chamber Music in Denver, the Montreal Museum of Fine Arts, Music Toronto, and the Union College Concert Series in Schenectady, and offering works of Beethoven, Haydn, Mozart, and Mendelssohn. Of its engagement at Carnegie Hall in 2009, The New York Times noted that the group performed with "elegant, detailed phrasing and carefully wrought playing." During a North American tour in 2012, The Philadelphia Inquirer raved “the group does tap into something well beyond notes and rests. No doubt this is what people mean when they talk about music casting a spell.” European engagements this season include a two-concert Haydn series in Wigmore Hall, two recitals in Amsterdam’s lauded Concertgebouw, a series of three performances of late Schubert Quartets at the Kilkenny Arts Festival in Ireland, and three performances of Hadyn, Mozart, and Donizetti Quartets at Scotland’s Lammermuir Festival. Quatuor Mosaïques has appeared in Europe, the United States, Australia and Japan and regularly performs in Vienna’s Konzerthaus, London's Wigmore Hall, Amsterdam's Concertgebouw, and Berlin's Philharmonic Hall, among others. Quatuor Mosaïques is often featured at such prestigious European festivals as Edinburgh, Salzburg, Luzern, Bremen, Bath, Styriarte Graz, Schubertiade Schwarzenberg and Oslo. The ensemble collaborates regularly with many international artists including pianist Sir András Schiff, clarinetist Sabine Meyer, and cellists Miklós Perényi and Raphael Pidoux. In 2006 Quatuor Mosaïques was invited to Spain to perform for King Juan Carlos I on the Monarch's personal collection of Stradivari instruments. Quatuor Mosaïques has enhanced their worldwide renown through their extraordinarily extensive discography which includes works of Haydn, Mozart, Arriaga, Boccherini, Jadin, Beethoven, Schubert and Mendelssohn as well as lesser-known composers. Of the group's  Schubert release The London Times wrote "their performance of Death and the Maiden is music-making of a high order, felt and carried out by players animated as though by a single mind and impulse, yet each of them seeming to respond afresh at every moment." Recordings of the Wiener Klassik repertoire (Haydn string quartets Op. 20, 33 and 77 and the quartets of Mozart dedicated to Haydn) have been awarded numerous prizes such as the Diapason d'or, the Choc du Monde de la Musique, and a Gramophone Award. A new recording of Beethoven’s late string quartets is slated for release on the Naïve label in September 2017.